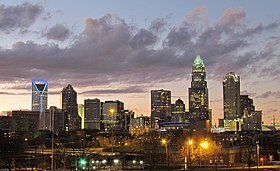 The Charlotte metropolitan area, also known as Metrolina, is a metropolitan area/ region of North and South Carolina within and surrounding the city of Charlotte. Located in the Piedmont, it is the largest in the Carolinas, and the fourth largest metropolitan area in the Southeastern region of the United States behind Miami, Atlanta, and Tampa. The Charlotte–Concord–Gastonia Metropolitan Statistical Area (MSA)  is defined as seven counties in North Carolina and three counties in South Carolina. The population of the MSA was 2,525,305 according to 2017 Census estimates. Charlotte is the 17th largest city and 22nd largest metro area in the United States. Charlotte is the 2nd largest city in the Southeast. The Charlotte– Concord Combined Statistical Area (CSA)  is a regional population area including parts of North Carolina and South Carolina with a population of 2,632,249 according to the 2016 Census estimates. The aforementioned MSA is the only metropolitan area (as defined since 2012) included in the CSA, but there are two included micropolitan areas: Albemarle and Shelby. The Charlotte Regional Partnership also identifies four additional counties to the what they refer to as the 'Charlotte Region'- Alexander, Anson and Catawba counties in North Carolina, and Chesterfield County, South Carolina. Catawba and Alexander counties are currently part of the Hickory–Lenoir–Morganton Metropolitan Statistical Area or ' The Unifour', and Anson County was once part of the MSA and CSA, until it was removed in 2011. The Charlotte region is also served by 2 major interstate highways ( I-85 and I-77), and their 2 spurs ( I-277, and I-485). I-40 also passes through the center of Iredell County, which is the northern region of the Charlotte metro. Other major freeways include Independence Boulevard (east Charlotte to I-277), a portion of US 321 between Hickory and Gastonia, and the proposed Monroe Connector / Bypass, each projected to cost over $1 billion per project. Primary state routes include NC/ SC 49, NC 16 (which extends north to West Virginia), NC 73, NC 150, NC 18, NC 24, NC 27, SC 9 and SC 5. Charlotte Douglas International Airport is the main airport in the Charlotte area and the 6th busiest in the country. In April 2007, Charlotte was the fastest growing airport in the US. The airport went on to surpass its sister US Airways hub in Philadelphia, Pennsylvania as one of the 30 busiest airports in the world in terms of passenger traffic. [ citation needed] A new terminal to the northwest of the center of the airport will be built in the near future, possibly as a Caribbean/Latin America international terminal. CLT is also supplemented by regional airports in Concord, Gastonia, Hickory, Monroe, Statesville, in North Carolina, as well as Rock Hill in South Carolina.